There are two main aspects to consider following an immobilisation, when it comes to fracture treatment. The first aspect concerns directly the immobilised extremity and its neighbouring joints, whilst the second aspect is related to secondary short and long term effects onto the other healthy extremities. The ideal surgical or conventional fracture immobilisation will only immobilise the fractured bones and will allow normal movement of adjacent joints enabling the bird to move and behave otherwise normally. Fracture healing in birds depends on the size of the involved bone and is usually very quick compared to mammals. Any immobilisation longer than 14 days will most certainly result in some degree of joint stiffness, which needs to be avoided and appropriately treated with active and passive physiotherapy. Splints have to be custom made and appropriately padded to immobilise the fracture sufficiently, but also to avoid pressure sores. Active physiotherapy will be offered by mutual agreement with the bird patient and by gradually increasing the freedom of movement by providing perches at different safe height levels and an increasing size of hospital cages, up to the size of a flight room or outdoor aviary. 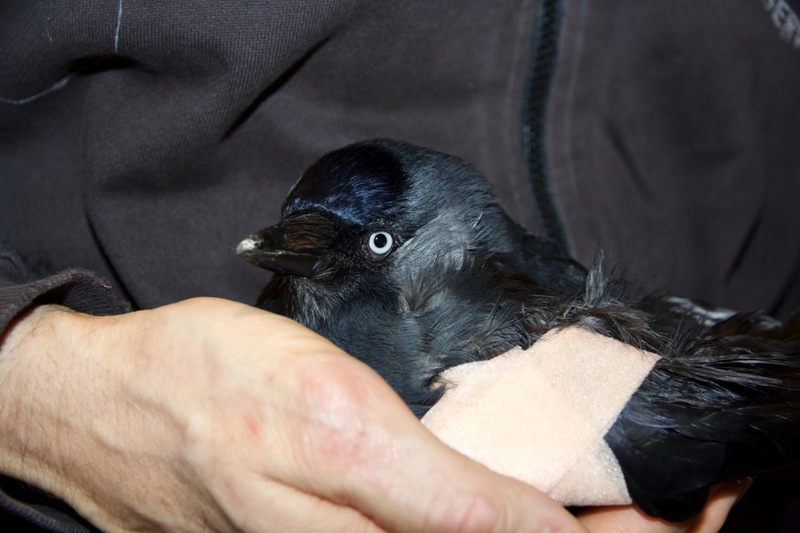 During the actual fracture treatment birds are usually kept in a rather confined space with the aim to optimise fracture healing and to reduce the risk of fracture displacement. 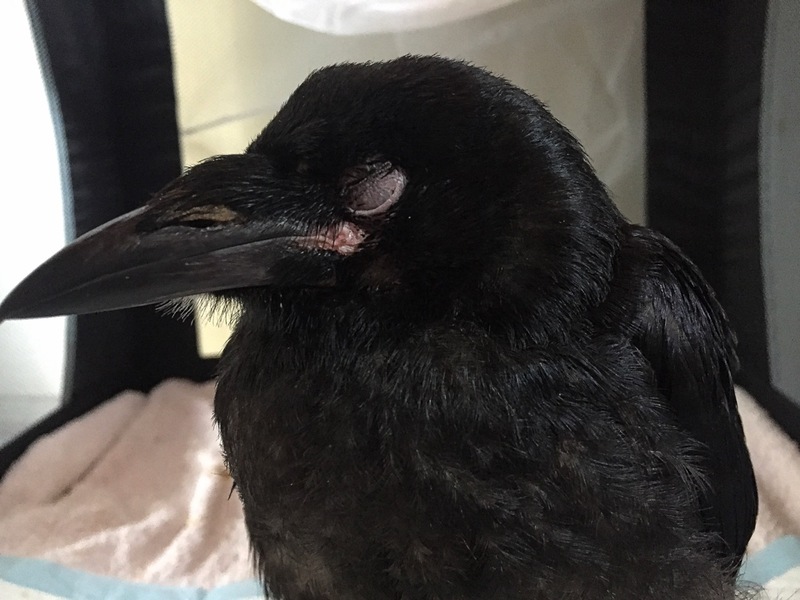 A negative side effect of this approach is that birds are forced to sit or perch continuously in the same position for a prolonged period of time, which can quickly lead to pressure sores, if no precautions are being taken. 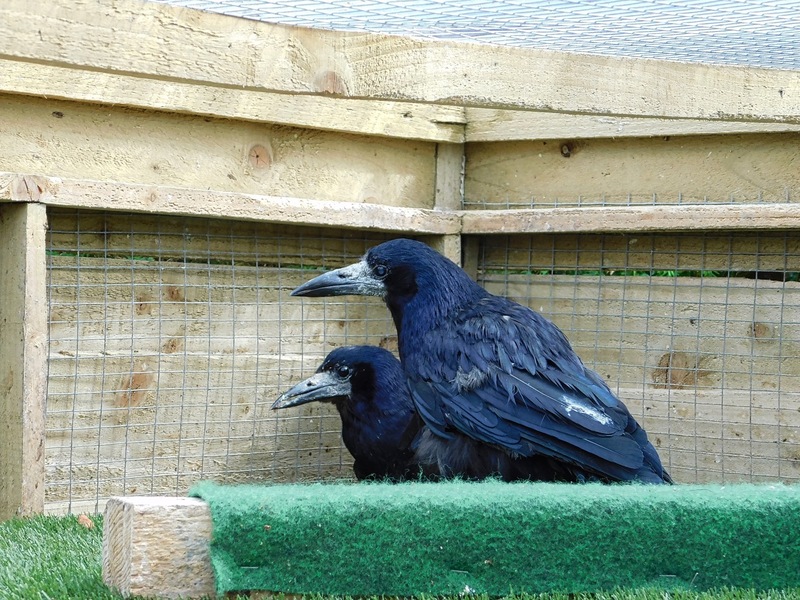 Soft rubber flooring and blocks as well as thick towels, as routinely used for sea and water birds, can also be used for corvids. Carpeted static perching blocks, padded straight or rubber bow perches are coming in useful for heavier birds like birds of prey and corvids. Padding materials most commonly used are outdoor carpet, vet wrap and artificial grass carpet or astro turf, which all will help to avoid pressure sores or ulcerative pododermatis, also known as bumble foot. Perches and seating blocks have to be custom made and might need to be adapted to make sure that birds can safely use them. An appropriatly chosen design will also make sure that birds will not soil or damage their plumage, which is a goal that must be of the highest priority. Mostly raptors, but also occasionally corvids might benefit from tail guards being applied. The optimal design for the hospital cage or box being used in the acute phase of the fracture treatment depends on species and personality of the bird patient. Hyperactive or easily stressed birds are best kept in wireless cages, where they can’t climb and injure themselves and which should provide them with sufficient shelter to hide. A partly covered flexarium, which is a portable mesh fabric aviary originally designed for reptiles, is ideal for smaller or young birds, but will not withstand for long the beak of a larger corvid. When caring for longterm patients or permanently disabled birds, all these before mentioned problems become even more important and require that these birds are very closely observed at all times, as their specific situation can change at any time in one or the other direction. 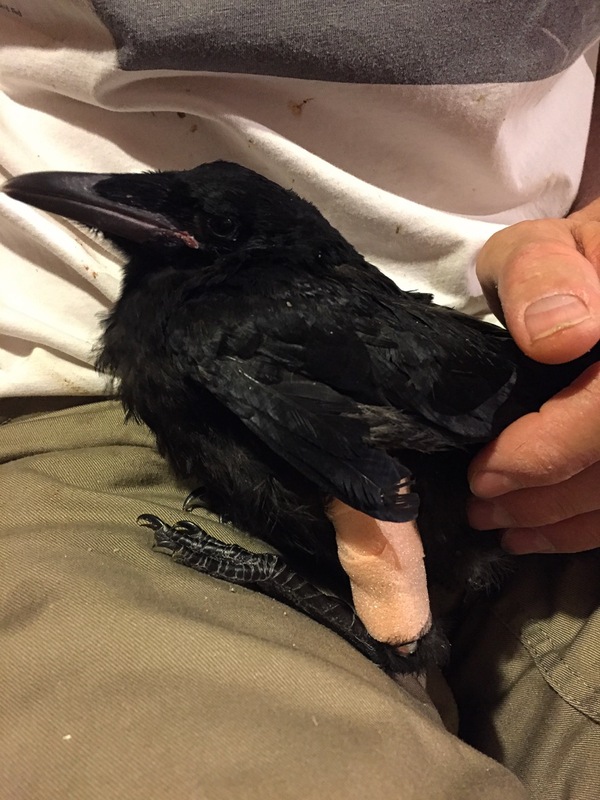 The most common reason for corvids to become resident birds are wing injuries, which heal not sufficiently to enable birds to regain their full flight ability, or which require a partial or complete amputation, like compound fractures or osteomyelitis. Most corvids cope well with unilateral partial or even complete wing amputations, younger birds usually having a slight advantage. These birds usually learn quickly to adapt. However, the aviary design has to be adapted and sensible precautions need to be taken. Tree stem piles, ladders, staggered shelves, slopes or ropes are just a few aviary design options, which will enable disabled birds to move safely from the aviary floor to higher roosting places. Sheltered roosting plateaus made of planks can help to avoid birds falling down in particular during night time. Perches or seating blocks can be placed onto or above these platforms, which will make roosting safe but also more comfortable and natural. Favourite perches can also be secured by creating wood bark play areas underneath, which will dampen an accidental fall. It is also advisable to create roosting or shelter areas away from the aviary entrance, which should also incooperate safe exit routes for birds to move away from a carer entering the aviary. These measures should also allow birds to safely pass each other and to move away safely from the carer, who at some point has to clean the farend shelter area as well. Wing amputated birds will spend more time sitting than their counterparts being able to fly. This means that these birds are more prone to pressure sores and bumble foot. This is why bird perches are actually a very important piece of bird furniture as they have a huge impact on health and happiness of bird patients. A bird’s leg has four main bones. Birds have a femur articulating with tibia and fibula. They also have a bone called the tarsometatarsus, which is the most visible part of a birds leg, and is articulating with tibia and fibula as well as the actual foot. When a bird’s leg is straight, it can open and close its foot at will, the same way humans would open and close their hands. When a bird’s leg is bent, like it is when a bird is perching on a branch, the bones lock together and the tendons cause the toes to clamp shut. This is why birds can sleep without dropping of the branch they are perching on. Perches with smooth surfaces are not natural for a bird’s foot, especially if smooth plastic or wooden dowel perches are the only ones available. This is because the bird’s foot will have a constant even pressure on it, unlike with a natural branch. This constant pressure can cause the skin to start thinning on the bottom of the foot, which can eventually lead to cracks, sores and infections. Wood perches naturally vary in diameter along their length, letting the bird exercise their feet. Natural non-toxic perches of different diameters will not just only help to avoid health problems, they also have a good entertainment character for corvids, as they love to strip the wood bark off branches. However, this also means that these branches might need to be replaced occasionally. Favourite roosting places will benefit from additional padding as described above, which is also very prone to corvid related wear and tear. Rope perches are a potential alternative, but usually only for healthy birds. They also have the potential to be dangerous, if the rope gets old and loose, or there are a lot of stringy fibers hanging off it. These rope perches need to be maintained and regularly replaced, but are good fun and exercise for mobile birds. So called grooming perches, which are made of concrete, sandpaper, sand or pumice are generally to be avoided, as they can be too abrasive and cause damage to your bird’s feet. Regular trimming of toe nails of disabled bird is a regular requirement though. 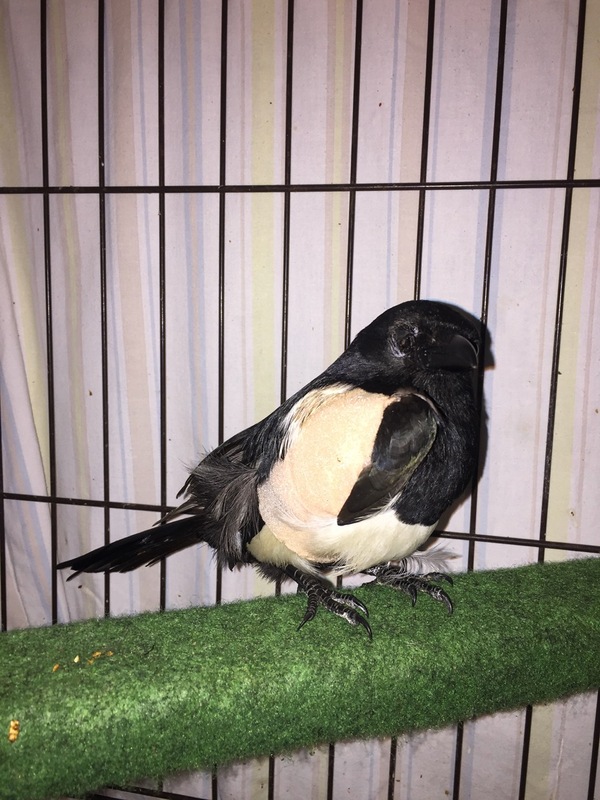 Another set of problems needs to be taken care of, when caring for birds with joint stiffness, arthritis, foot or leg amputation. These problems become even more important, when these birds are also unable to fly or are getting older and less mobile. 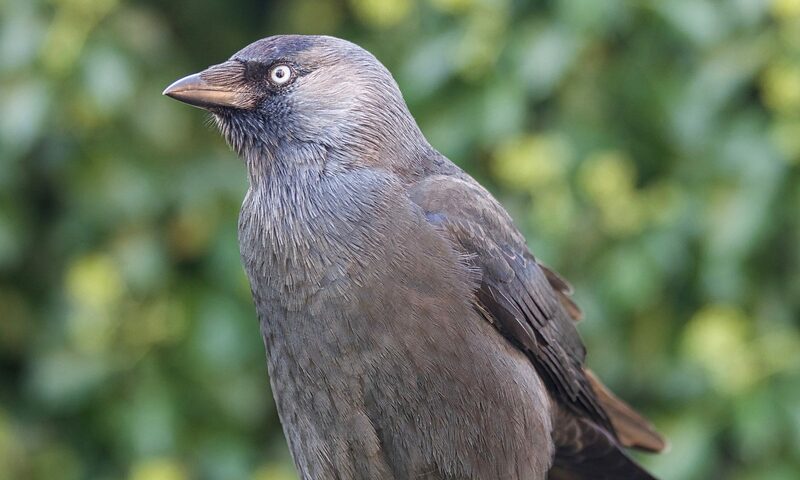 Due to their low weight, jackdaws are usually coping well with a foot amputation or joint stiffness, which both could render one leg unusable. Heavier crows and rooks can cope as well, in particular when young and strong. However, the avairy needs to be adapted accordingly. Perches need to be at least partly replaced with flat padded wooden boards, which should allow the bird to sit and rest comfortably, but should also help to avoid the plumage being damaged and soiled. Roosting platforms are best carpeted with non-slip thick artificial grass mats, which can be replaced and hosed down daily. Birds need to be monitored very closely and a weekly bath with lukewarm soapy water may become part of the normal routine, as these birds may struggle to preen themselves efficiently, in particular when they are getting older. Access to food and water has to be guaranteed, which also means that competition with other inmates needs to be avoided by providing ample food and feeding opportunities in different areas of the aviary, also bearing in mind that this is never a static scenario, as bonds and friendships can change. Despite optimal aviary preparation and design, there is an increased likelihood that foot and joint deformities as well as pressures sores may develop, which need to be avoided and require frequent checks and health assessments. Another group of birds with special needs are birds with visual impairment, which can obviously range from being only partially sighted to being completely blind. Depending on the degree of impairment, birds may be able to join the fully sighted aviary community, or may need special aviary adaptations to avoid accidents and injuries. These birds require close observation in particular within the first weeks of them being in their new aviary. During this time of intensive observation it is quite common that the aviary design needs to be frequently adapted to achieve the desired results. 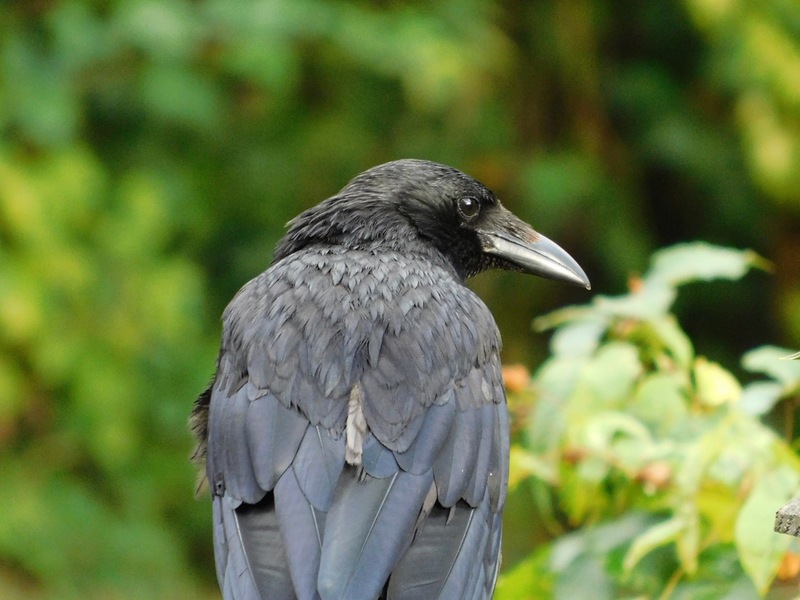 Corvids usually adapt well, but this may depend on personality and age of the animal concerned. Blind birds will do best with a combination of an indoor bird room and daytime outdoor pen or aviary. These birds will spend most of their time on the ground and need therefore insulated flooring or substrate in particular during winter time with sufficient shelter from the elements. The interior design needs to take in account that these pens or aviaries are completely safe without dangerous obstacles or crevices. 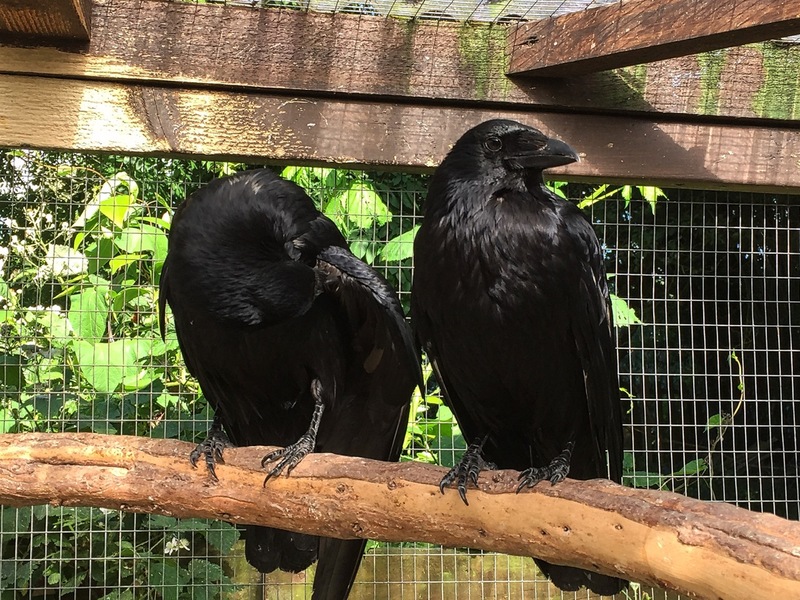 Elevated padded roosting places are essential, as are toys and natural materials like a wooden tree stem corvids can get their beak on. It is of upmost importance that the final aviary or bird room design remains static and will not be changed, which is in particular important for food and water sources. As with all disabled birds, it is crucial that drink bowls and bird baths are shallow and of appropriate size, so that birds are not at risk of accidental drowning. If in doubt, we would not provide a bird bath at all, but would offer a shower once or twice a week, which can be easily provided with water spray bottles. Monitoring birds is crucial at all times, but in particular when new birds have been introduced or the aviary setup has been adapted. Remote monitoring with CCTV or webcam can also be of great advantage, as birds will display their normal behaviour and a more objective assessment of the situation can be obtained, even at night time. Last but not least, all temporarily and permanently captive birds need special environmental enrichment to prevent or decrease stereotypical behaviour, which also has to take in consideration the special needs of their disability to ensure their psychological well being and safety. Next PostNext Why Should We Help Non-Human Animals?